At this point its time to create the guilds and organizations that will be central in your campaign. The guilds are really just a way to present new ideas/concepts to your world, and by creating them as a guild, if they prove to be unbalanced during play, its easy enough to explain their change and/or disappearance due to other Guild's reactions to their inner workings. The Organizations on the other hand may have minor, or major impact on the extended play in your world, so careful thought is needed not to overpower the proceedings early on. Within these organizations you may well find a truly nefarious character or organization that becomes the parties nemesis. I will stress at this point, unless you have a nemesis already fully designed, its best to see where the players go, and not "force" them onto a path where they meet this particular NPC - let the PC's lead the way and plan accordingly. 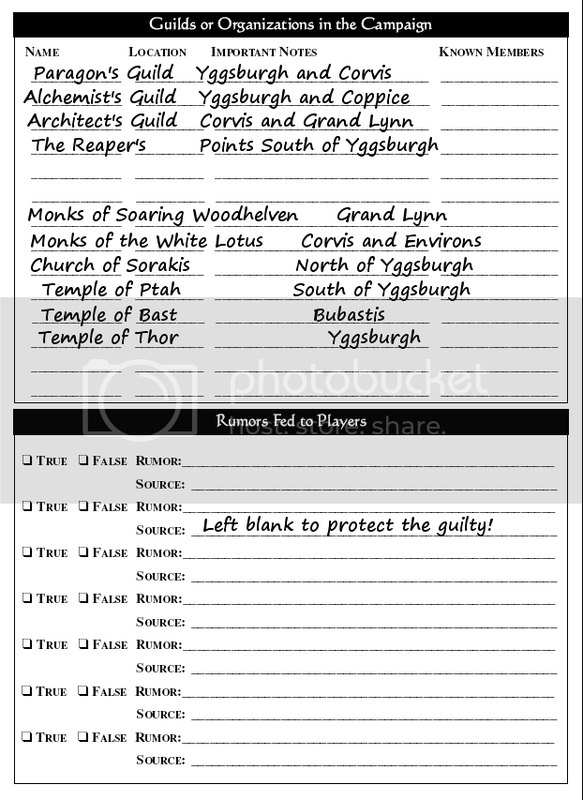 For this step, I created 4 guilds (in addition to existing ones) that might prove to be of aid to the party. Since my campaign uses gem stones in a more magical sense, introducing the Paragon Guild into the campaign was a consideration I leaned towards early on. I initially created 6 organizations, of which most have some religious tie. Others are much more benign in their design at the onset, and may be developed further down the road. This section is for some detailed notes on special events, tournaments or places the PC's may encounter/travel to. In my case, 3 of the players wanted to create 1st level Monks, yet all three were not sure how long they would survive in the new campaign. Once they were on their way, one idea I had was to create a tournament to entertain and give them a chance to do battle in non-lethal combat while presenting them with a chance to role-play specific attacks. 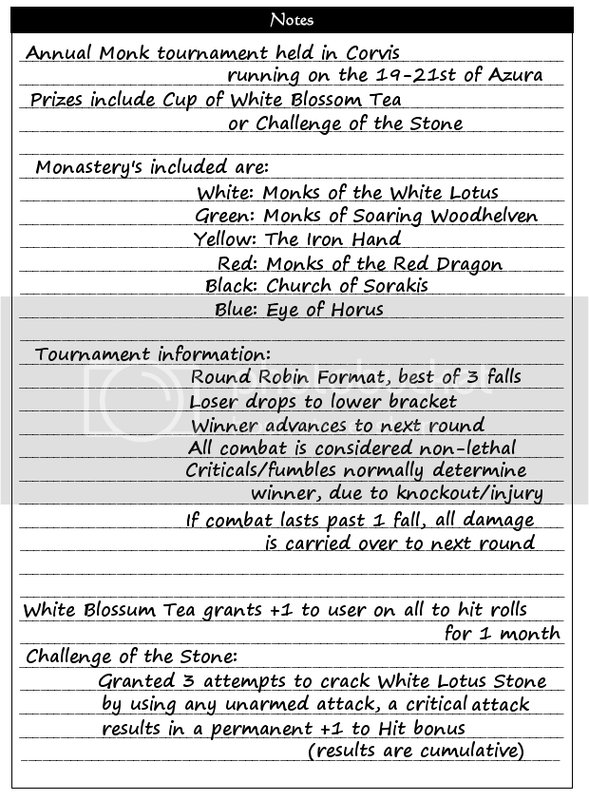 So on the fly I designed a round robin style tournament, and created a quick and dirty combat system. When they arrived at Corvis and spent the night, the next morn they awoke to flyers all around town that spoke of this tournamnet. 1 of the players named each of his attacks, so before the die was rolled for initiative, he would scream out "Flying Tiger Claw" then we'd roll for the advantage. The other 2 quickly picked up on this and hammed it up, coming up with phrases suited to their players style. I created a 16 monk bracket, and rolled for the NPC matchups. All in all, the final pitted 2 of the players against each other, and everyone had a grand time. The 4th player at the table was so enamored with the fighting styles, he created a monk during the session, and got him in on the action.